Alkyd surface coatings continue to be one of the most highly consumed types of coatings used in the world, despite the increasing use of other film formers. The success of alkyd resin systems is a result of their relatively low cost, versatility and long familiarity with users. They can be tailored to meet a variety of end-use requirements through the choice and ratio of reactants and/or modifiers. Alkyds are used extensively in architectural coatings, product finishes and specialpurpose coatings. Promoters of alkyd resins note that they are partly made from fatty acids or oils derived from renewable sources, making them greener than most competitive coating resins. Alkyds were the first synthetic coatings binder used in commercial practice, first used in large quantities in the 1930s. Polyesters, also referred to as oil-free alkyds, are made in the same equipment as alkyds and use many of the same raw materials. Polyesters are used almost exclusively in industrial baking finishes. 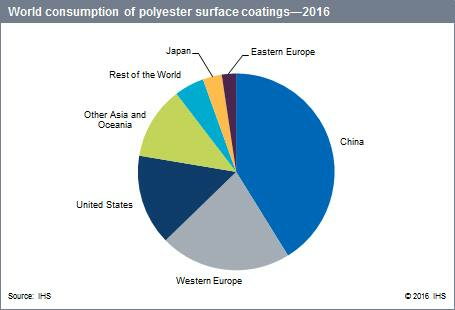 The following pie chart shows world consumption of alkyd/polyester surface coatings. Despite the continuing decline in the market in North America, Western Europe, and Japan, alkyds remain one of the leading types of coatings used in the industrial marketplace. In North America, Western Europe, and Japan, consumption of alkyds has diminished over the last 30 years. In the architectural or decorative coatings market, solventborne alkyds have been steadily replaced with waterborne emulsions because of their lower odor, lower solvent content, easy clean-up, and fast drying properties. However, in some applications, these emulsions do not display the same degree of performance in leveling, adhesion, gloss, and certain resistance properties. These drawbacks have stalled the conversion from most solventborne gloss trim, wood stains, and light maintenance coatings, so solventborne alkyds still remain a sizable factor in the coatings industry. However, restrictions on the use of paints are becoming tighter in certain parts of the United States and in Europe, which will forbid the use of conventional low-solids (i.e., high-solvent-containing) solventborne coatings. As a result, the types of resins used in these regions in certain applications will change significantly. Most use of polyester coatings in the United States is in metal furniture, construction, appliances, and transportation, businesses which are mature and grow at GDP-like rates. Growth is expected to be 3.0% annually during 2016–21. The heavily populated regions in California and the northeast United States have adopted regulations that severely restrict the use of solventborne coatings in many architectural and industrial maintenance coatings applications, especially where there are acceptable latex coatings (e.g., flat house paints). In the product finishing market, use of alkyds has declined in recent years because of their replacement with more environmentally acceptable and/or durable coatings (e.g., urethanes, powder coatings). Some users have switched to polyesters, thus lessening the impact on the alkyd/polyester industry. Alkyd use in special-purpose coatings has declined considerably because of VOC regulations imposed on traffic paint and auto refinishes, plus the availability of acceptable replacement coatings. Consumption should decrease at about 1–2% per year during 2016–21. Producers continue to develop new and improved systems for high-solids and waterborne formulations to meet increasingly stringent air pollution regulations. In recent years, producers of alkyd resins have developed waterborne latex resins that meet the low VOC levels required by recently enacted legislation in certain parts of the United States and Western Europe. Generally, though, these environmentally friendly systems are considerably more expensive than the conventional systems, and have some technical drawbacks. Some producers are confident that properties of alkyd emulsions will be improved significantly to gain market share. Also, the industry has been blending waterborne alkyds with acrylic emulsions to combine the desirable properties of both systems. Polyesters are offered in high-solids, waterborne, and powder coatings. Global consumption of alkyd coating resins and alkyd coatings is forecast to grow at an average annual rate of about 3% during 2016–21. Average annual growth in the consumption of polyester coating resins and polyester coatings will be 5% during 2016–21.